Tennis Stars Video Slot Machine - Casino Answers! Tennis Stars is a 5-reel, 40-line video slot developed by Playtech, featuring a wild symbol, scatter wins, multipliers, a free spins feature, a gamble feature and a bonus game. You can play the Tennis Stars video slot at Bovada. The Tennis Stars casino game is a nickel slot machine. Coin values on the Tennis Stars slot machine are $0.05, $0.10, $0.20, $0.50 and $1. You can select from 1-40 paylines at 1-10 coins per line. The maximum total bet available on the Tennis Stars online slot is $400 per spin. The Tennis Stars slot game has a great betting range that will suit any online slots player – from the casual players to the high rollers. Players can use the “Stop” button to manually skill stop the reels in mid-spin. To play the Tennis Stars video slot, select your bet and press the “Spin” button. For players looking to play all 40 lines at 10 coins per line, you can use the “Bet Max” button to spin the reels on Tennis Stars. There are two top-paying symbols on the Tennis Stars video slot. They are the Male and Female Tennis Player symbols. When you land 5 of a Kind of one these two symbols, you will win the 5000 coin top jackpot. The symbols cannot mix and match. The second highest paying symbols are the Tennis Shoes and Tennis Balls symbols at 1000 coins. The Trophy is the wild symbol on the Tennis Stars slot game. This symbol will substitute for all symbols except for the scatter symbol. It will only appear reels 2, 3 and 4. 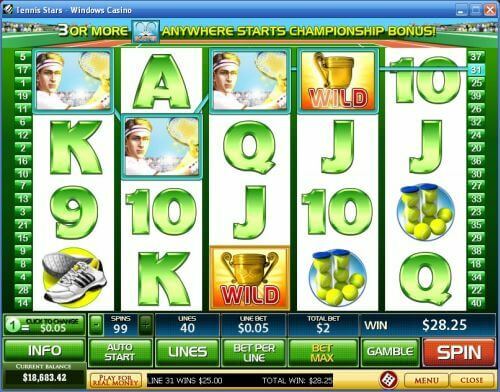 When the Trophy wild symbol appears on reels 2 through 4, you will 15 free spins at a 3X multiplier plus 10X your total bet. All wins during the free spins feature are tripled. You can trigger the bonus game during the free spins feature, but the bonus winnings will not be tripled. You can re-trigger the free spins feature to infinity. You can win huge from the Tennis Stars free spins feature at Bovada! If you are not satisfied with how much you have won on a spin, you can risk your winnings to potentially double your win with the gamble feature. Press the “Gamble” button after any win to activate the gamble feature on the Tennis Stars video slot. Your goal will be to correctly gues whether the next card will be Red or Black. You can keep risking your winnings until you lose, until you hit the “Collect” button or until you hit the Double Up Limit. In the case of Windows Casino, that limit is $5000. You can exit the gamble feature at any time. Payouts are displayed on the Paytable. Only the highest win per selected payline will be paid out. Winning combinations pay from left to right only, except for scatter wins (which pay any). Payline wins are multiplied by the line bet. Scatter wins are multiplied by the total bet. Malfunctions void all plays and pays. Tennis Stars offers a basic autoplay mode. You may use the “+” and “-” buttons under “Spins” to select from 1 to 99 autoplay spins. To begin the autoplay mode, press the “Auto Start” button. You can stop autoplay at any time by hitting the green “Stop” button that has replaced the “Auto Start” button. Playtech comes through once again with the Tennis Stars video slot. It has a bonus game, free spins feature, gamble feature and more! The bonus game may take a while to trigger, but once you get it, it’s a lot of fun and definitely worth playing. If you’re a fan of tennis, we recommend you play the Tennis Stars video slot by signing up today at Bovada! Where can I play more tennis-themed slot machines? If you are looking for another tennis slot game, you can read more tennis slot reviews on our list of sports-themed slots. Can players from the USA play the Tennis Stars online slot game? No, American players cannot play the Tennis Stars slot game for real money. Instead, please visit Bovada for many USA-friendly slots. Is there a Tennis Stars Flash game available that I can play in my browser? Currently, you have to download the casino software from Bovada to play the Tennis Stars fruit machine. However, we expect Playtech to add a no-download version of Tennis Stars in the near future.